If you are a target shooter, benchrest shooter, varmint hunter, rifle collector, gunsmith or even an everyday hunter you will find the Hawkeye borescope a valuable tool for leaning about the care, cleaning and quality of your rifle barrels. 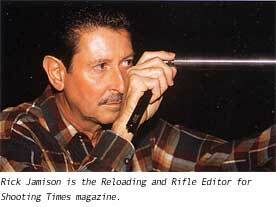 A high quality, well maintained rifle barrel leads to tighter groupings on the target. 90 degree direction of view is achieved by sliding mirror tube onto the scope. Following is what one shooting expert has to say. 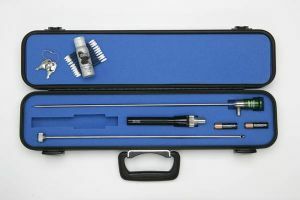 "When I started using the Hawkeye® Borescope, I was amazed at the clarity of the view with this relatively inexpensive and easy-to-use device. The Hawkeye gives you an up-close and magnified view inside a rifle barrel, so that you know precisely what is there, without guessing. Without a borescope you have no way to know what is going on inside your rifle's bore because you simply cannot see it. Holding a barrel up to the light and looking through it from one end is all but worthless, when it comes to judging its condition. The Hawkeye has given me a first-hand look and taught me things about a rifle that I never knew and I doubt many people know. Barrels are not the end of the uses of a Hawkeye. I've used mine to examine the interior of loading dies, cartridge cases, and lug recesses. Places that you cannot normally look into are readily accessible with a Hawkeye. The fact is that my Hawkeye is so valuable to me that I wouldn't be without it. After being seriously involved in the shooting sports for a lifetime, I know that after a rifle there are two things I wouldn't be without—a chronograph and a borescope. If I were just starting out today, I would buy both before I purchased my second rifle. After looking through scores of barrels, I have gotten an education about all sorts of things and these are just some of them:"
What is the surface condition like? Have the reamer marks been lapped out? Are there major blemishes? Was the chamber throat cut concentric, indicating a straight barrel in this region, or is it longer on one side? How smooth are the chamber and throat? Is the cleaner really working? How much more scrubbing is necessary, and where? Is my cleaning method damaging the bore? Exactly how worn and rough is my chamber throat? How far down the bore is heat cracking present? How fouled is the bore and where does fouling occur — in the bottom of the groove, on the leading edge of the land, on the top surface of the land — or where?